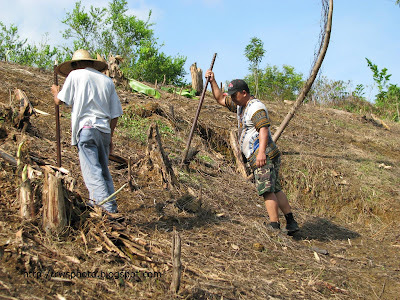 The traditional way of hill padi planting can be both strenuous, back-breaking and fun. After the land has been cleared and burned, and more tiding up, the farm owner will determine a date for planting. No fix system is used nowadays as padi planting has become a part-time farming hobby. The common practice now is to do planting on weekend or public holiday as the farm owner will be able to call for more free labour (akin to mutual help). This get-together-padi-planting kind of thing is called gotong-royong. Don't be surprise if you meet a total stranger who help with the planting. Another thing about this important day, is that the padi planting for hill padi must be done within the same day. Work must be done when everyone is around. 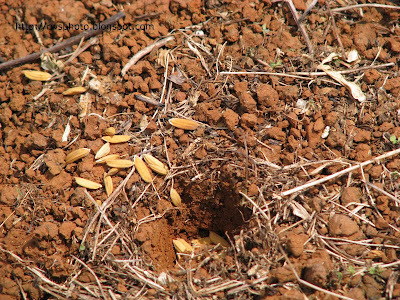 Anyway, the planting system for hill padi is device in such as way, that menfolk will lead the planting each carrying a "turuk" or heavy stick (with sharp end) to puncture a hole (called "nuruk") on the ground and the womenfolk following from behind will throw the padi seeds into the holes. Nuruk time. Men lead the way puncturing holes into the ground with spear-like heavy stick (called "turuk"). Try it for a solid 2 hours without glove and you'll get your hand blistered. 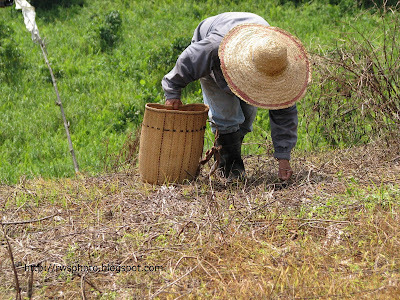 The padi seeds inside the basket (called "tambok") are pinched and thrown into the holes, punctured earlier by the turuk. For young people, bending like that for a couple of hours would be a real torture. Womenfolk taking a short break. Notice the lady on the left have a tele-conversion on her cell-phone. 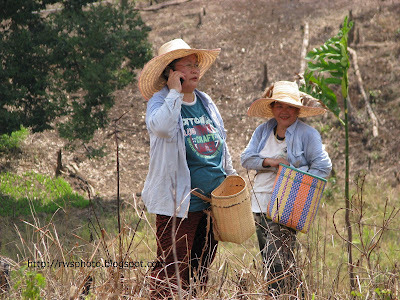 Some Bidayuh farms, due to its proximity to Kuching city are accessible to mobile telecommunication. 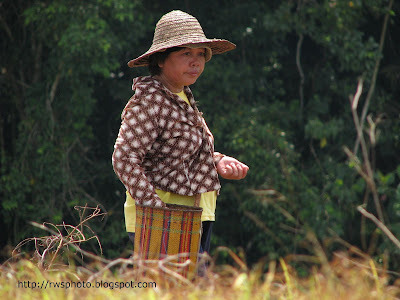 A Bidayuh lady digging into the tambok for padi seeds. Messy hole. The padi seeds landed at the rim of the hole. Must be man's work. Neat hole. 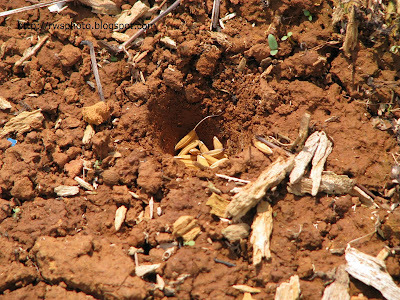 Notice all the padi seeds landed inside the hole. That's the correct way to do it because you don't want the rain water to wash away the seeds. Remember, it's hill slopes and gravity rules.